It’s been quite awhile since I’ve updated my blog. I don’t get a lot of response so it comes late on any list of to dos. 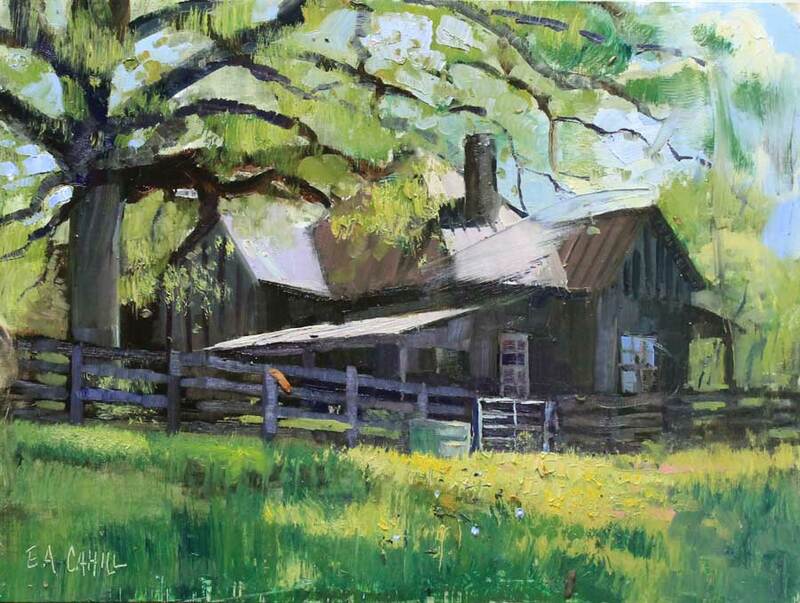 It’s been a busy Spring with several competitions and a trip to Apalachicola, all dedicated to painting and selling as much as I can. I’m doing much less ad work and more painting —which is what I want but like much in my life I tend to back into things and this is no exception. I’ve had very little success in winning anything but I have sold quite a bit of work—weather it ads up to much money and replaces my graphic design work is questionable. I work hard at painting and little by little progress and improve —I hope. Like any skill of merit it take practice, practice and more practice. With painting it never ends—the more you know, the less you know. Going back a few month is hard for me. The older I get the more I tend to file away my past into volumes in my dimly lit brain. 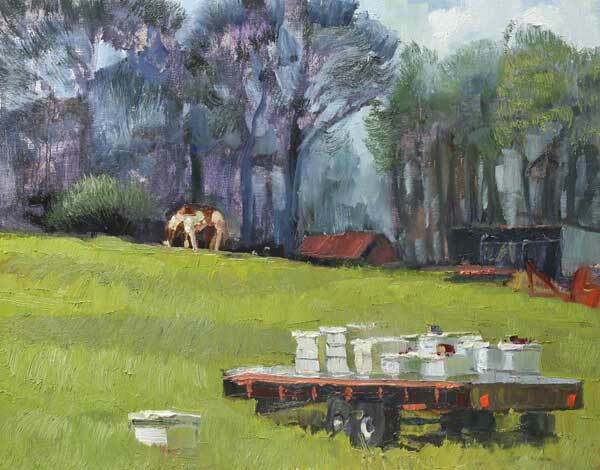 I’ll start with more work from Mabry Farm. This Spring I found out the the original farmhouse and the acreage around it has been sold to a developer. They have not done any clearing yet but plans include the demolition of the 1914 farmhouse that I am so fond of. Consequently I’ve been instilled with the idea of the getting the word out with the thought that someone may come to rescue! We’ll see…in the mean time I continue to paint it. 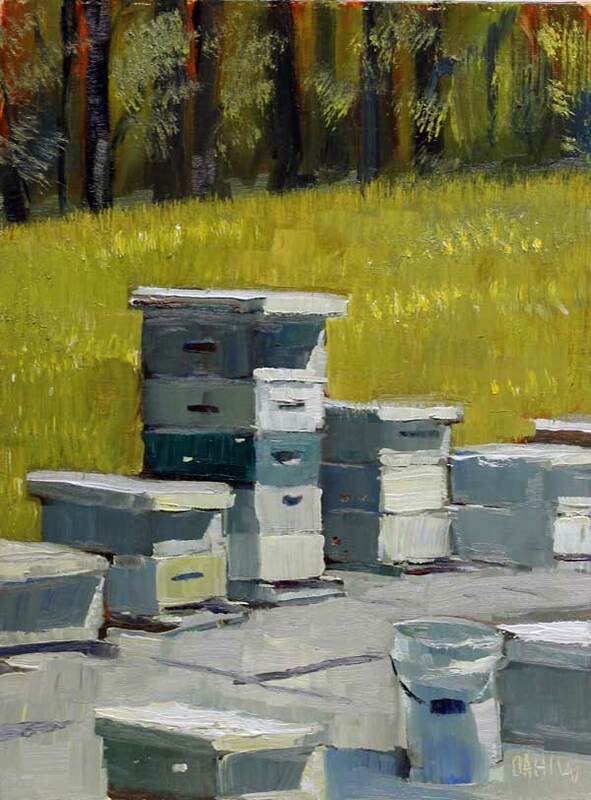 Lately I’ve spent a lot of time painting views of the the bee hive or apiary —as it’s called. 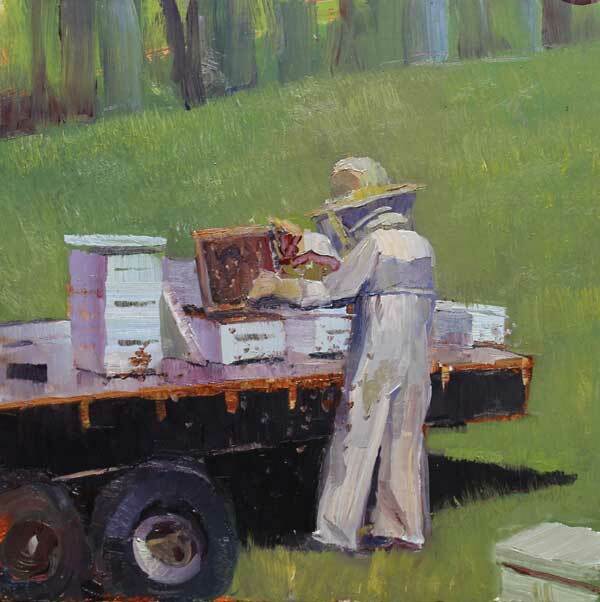 My wife recently needed local honey for her ailments and I was amazed at the wonderful taste of local honey that I naturally acquired from the only source I know. I now wonder why I have not spent more time painting this rather interesting collection of boxes out in the light. I’m making up for it. The Clover Field 12 x12″ —isolated by a fence to avoid horse feeding, this is bee food to the hive in the background. Jim Mabry can be seen here too. A big 12 x24 done recently of the entire apiary —this is on an old trailer so it can be moved and also is isolated from the surrounding woods to avoid the the bees moving away. Hello Ed. Thank you for posting your work and blog notes. I’ve enjoyed both. Having lived in Marietta for 35 years, I’m very familiar with the part of Azalea Drive you captured so well. My wife and I have now moved to east of Jasper just off of Hwy 136. 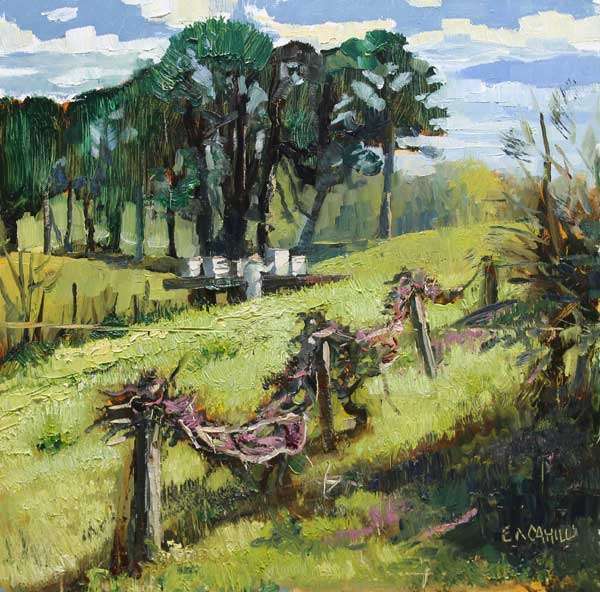 We have great places to paint plein air if you’d like to visit. 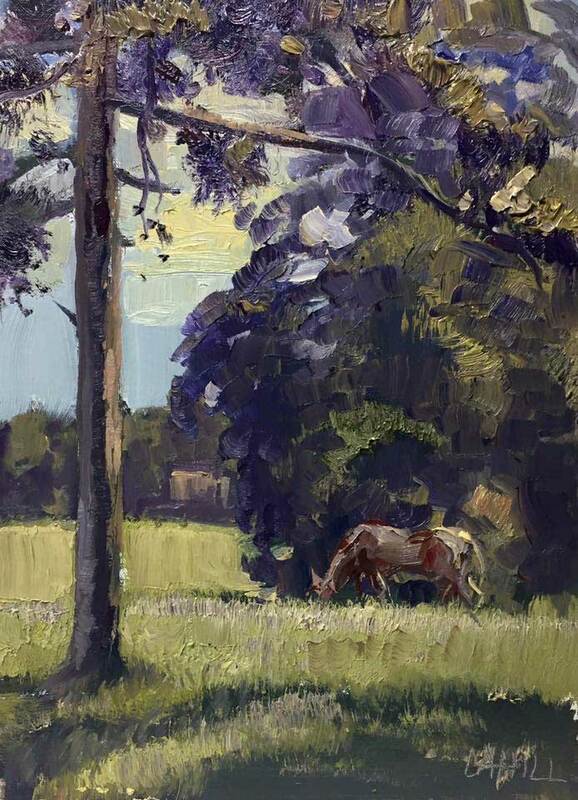 I’ve just started oil painting and find plein air a challenge. Your work is inspiring. Please keep posting/blogging. Best regards, Paul Baldwin. Thanks for your note Paul. I sure would like to get up to your neck of the woods soon. You are welcome to join me on the boardwalk too.